Merriam-Webster defines indigenous as “living, or occurring naturally in a particular region or environment.” According to the United Nations, “there are an estimated 370 million indigenous people in the world.” In 2007, the United Nations declared that August 9th is the International Day of the World’s Indigenous Peoples. In honor of the tenth celebration of this event, here is a small tribute to the music of Native Americans. According to the editors of History, Native Americans are descendants of nomads “who hiked over a ‘land bridge’ from Asia […] over 12,000 years ago.” Experts estimate that “more than 50 million people” (with more than one thousand individual cultures) inhabited the Americas by the time European explorers landed in the 1400’s. As Europeans began to colonize what is now the United States, the majority of Native American languages were extinguished. According to the Encyclopaedia Britannica, “more than 50 percent of the surviving languages have fewer than 1,000 speakers each.” Remaining languages include Navaho (New Mexico, Arizona), Ojibwa (northern U.S.), Cherokee (Oklahoma, North Carolina), and Dakota-Assiniboin (midwest). According to the Columbia Electronic Encyclopedia, music in Native American culture is most frequently used to “communicate with the supernatural” as part of a ceremony; “bringing of rain, success in battle, or the curing of the sick.” The music of Native Americans is “primarily a vocal art” characterized by a single descending melody, “frequent strong accents,” and an irregular rhythm. Melanie McManus from How Stuff Works: Culture, points out that singing is not only a critical element of Native American culture, but “also helps preserve Native American languages” and stories. Traditionally, music in Native American ceremonies are accompanied with dancing. Performers often dance in groups (divided by gender) in a circular pattern. Additional rattles are sometimes added to clothing or carried in order to enhance the music with the dancer’s movements. Prominent instruments in Native American music include drums, rattles, flutes, and whistles. 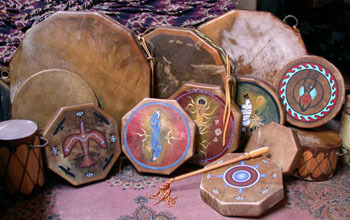 Scholars believe that drums in Native American music are used to symbolize “the Earth’s heartbeat” and are therefore present in the majority of works both sacred and secular. Although the instruments varied by tribe, drums were most often constructed by stretching tanned animal hide across a large wooden frame or hollow log. Rattles are popular in the majority of Native American cultures. The instruments are fashioned from multiple materials; gourds or turtle shells filled with pebbles, animal horns, or pockets sewn from rawhide. Cedar wood was most frequently used to construct Native American flutes. Other variations on the instrument included a body of animal bone, bamboo, or clay. According to Michael Suing from the Metropolitan Museum of Art, the (courting) flute was traditionally used by men “to sway the affections of women.” In modern times, both men and women solo on the instrument. Modern Native American music varies greatly by tribe and region, but several contemporary groups, like the Porcupine Singers (http://porcupinesingers.tripod.com) of the Lakota tribe, work to breathe new life into traditional styles. A large percentage of Native American musicians have embraced newer musical styles like country, rock, or jazz. Notable groups include Apache Spirit (http://apachespiritband.wixsite.com/spiritband), the Blue Mountain Tribe (https://www.bluemountaintribe.com), and Medicine Dream (https://www.medicinedream.com). There is also a strong Native American presence in classical music. Successful composers include Timothy Archambault, George Quincy, and Jerod Tate. The annual Native American Music Awards (https://www.nativeamericanmusicawards.com), hosted by the Native American Music Association, aims to showcase “outstanding music initiatives” and promote appreciation for Native American culture. “International Day of the World's Indigenous Peoples.” United Nations. United Nations. N.d.
Britannica. Encyclopaedia Britannica Incorporated. 08 July 2016. Web. 07 July 2017. “Indigenous Music and Dance.” Welker, Glenn. Indigenous People. N.p. 10 December 2013. 2012, Columbia University Press. Web. 7 July 2017. "Indigenous." Merriam-Webster.com. Merriam-Webster, N.d. Web. 6 July 2017. “10 Native American Music Traditions.” McManus, Melanie Radzicki. How Stuff Works: Culture. InfoSpace Holdings LLC. 25 July 2011. Web. 7 July 2017. “Great Plains Indians Musical Instruments.” Suing, Michael. Heilbrunn Timeline of Art History. New York: The Metropolitan Museum of Art, 2000-July 2008. Web. 7 July 2017.